Foreign Minister Nkosazana Dlamini-Zuma has concluded an official visit to Kuwait as part of efforts by South Africa to expand trade and investment in the Middle East and Asia. 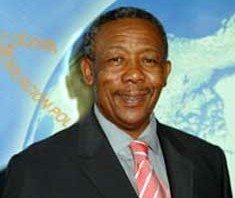 South African National Police Commissioner Jackie Selebi was elected the new president of Interpol, the world's largest international police organisation, at the body's 73rd general assembly in Cancun, Mexico. 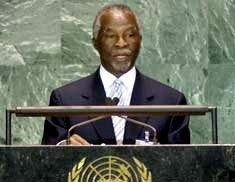 President Thabo Mbeki stated a strong case for the world's poor at the 59th session of the United Nations General Assembly in New York on Wednesday, saying that world leaders had failed in their Millennium Declaration goals of helping to rid the world of war, poverty and underdevelopment. The government of Flanders has signed an agreement with South Africa involving an investment of R25-million in five new arts and culture projects over the period 2003 to 2005, with South Africa's department of arts and culture bringing an additional R5-million to the projects. President Thabo Mbeki has called on world leaders to put their differences aside and recommit themselves to strengthening the United Nations. South Africa and Japan have strengthened their ties with an agreement to cooperate in the fields of science and technology through exchange programmes for scientists between the two countries. President Thabo Mbeki welcomed US President George W Bush at a function in Pretoria on Wednesday, praising US commitment to South Africa and the continent. Bush described the SA-US relationship as "vital", saying it could help extend democracy and free markets across Africa.